Jeff Gordon's No. 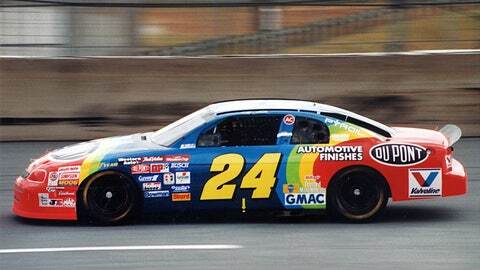 24 rainbow paint scheme became one of the most recognized in NASCAR history. It all started with a promise from Ray Evernham in the summer of 1992. The now-legendary crew chief was a young up-and-comer at the time and was looking to give Jeff Gordon a present for his 21st birthday. Evernham headed to NASCAR artist Sam Bass’ studio near Charlotte Motor Speedway in the hopes of getting a program cover. When Bass gave him the program free of charge, he added one condition: When Evernham and Gordon went Sprint Cup racing, Bass wanted a shot at designing their car’s paint scheme. True to his word, Evernham would later call Bass and give him the green light to develop three designs to be presented to sponsor DuPont. After putting together two designs, Bass came to the day of the presentation and a light bulb went off. "I had two of the designs done, and the morning of my presentation I was driving to work and it just hit me that DuPont and their automotive finishes brand were trying to portray that they had a rainbow of colors," Bass told FOXSports.com. "I thought, ‘Man, if I arched three colors over the top of that DuPont logo, which is an oval, that would be your rainbow.’ I did that on the hood. I did it on the sides. I put neon red, neon green, neon blue, neon yellow." Upon completion of his drawing, Bass said he immediately knew the rainbow design was definitely the best of the three he was submitting. "The story goes that DuPont had 43 drawings to select from," he said. "And they chose mine. It’s pretty cool and pretty special to be associated with that car and that driver for the whole 23 years so far." Long before the days of car wraps, the paint scheme would have to be painted in the body shop, utilizing the multiple bright colors Bass had used in his design. "I thought the guys in the body shop were going to kill me because it was a very complex car to paint," he said. The rest is history, and the rainbow design of the No. 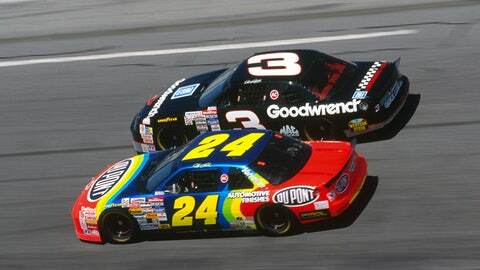 24 DuPont Chevrolet became one of the most iconic and recognized paint schemes in NASCAR history. Bass then recalled a meeting with Gordon after the design was approved to go over the paint scheme and work out the firesuit design. Upon being shown the paint scheme, Gordon’s only request for the firesuit? He did not want to look like a clown. "I guess the design worked, because he wore that firesuit for nine years," Bass said with a laugh. Just hours before Bass spoke with FOXSports.com on Thursday afternoon, Gordon dropped a bombshell, announcing that 2015 would be his final year running for the Sprint Cup championship. Sitting in a room full of his Gordon designs, paint schemes, and art, Bass tried to wrap his head around the "Rainbow Warrior" stepping away from a full-time role. "All I can say about Jeff is that he’s a class act," said Bass. "He has become a true friend over the years. He’s been so good to me in terms of a working relationship and friend relationship. I just think the world of him. I’ve been very blessed and very honored to be a part of his team. "He’s done so many incredible things," Bass added. "He really transcended the sport, taking it to whole new areas. I really believe with all my heart, that in the history of NASCAR you have drivers before Jeff Gordon and drivers after Jeff Gordon. But Jeff Gordon broke the mold and set the precedent for everyone that followed him, and, man, that’s something to be proud of."